The Senate recently approved an operating budget which would pay for government services and programs such as K-12 education and social services during the 2017-19 biennium. By the end of this week, the Senate may also take action on its other two budgets for the session, the capital and transportation budgets. I anticipate that the House of Representatives will release its operating budget this week and likely take action on its approval later this week or next week. The House majority will make different choices about how much to spend, where to spend it, and how to support the spending. That is a normal part of the budget process. Once the House adopts a budget, the two majorities can get on with working toward a final agreement. The 2017-19 state operating budget endorsed by the Senate makes significant additional investments into K-12 education within existing revenues. More than 50% of the spending would be dedicated to our K-12 system, a level that hasn’t been achieved since 1983 (K-12 spending currently accounts for 48% in the 2015-17 budget). To view education spending in a historical context, the budget for the 2011-13 biennium allocated $13 billion for K-12 education. The new Senate budget, when carried out to 2019-21 (state law requires the Legislature to budget on a four-year outlook), would invest $27.6 billion for schools, more than double the spending since 2011. It would be very disappointing if the state Supreme Court doesn’t consider this to be “ample” funding for schools. The Senate budget supports a $1.7 billion education-policy overhaul that could be the final step in the legislative response to the Supreme Court’s McCleary decision. This would increase funding to school districts while implementing a flat local-levy rate of $1.55 per $1,000 assessed property valuation. 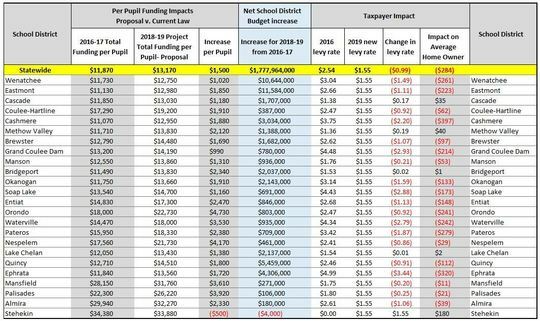 The $1.55 rate is much less than what most of our area school districts are assessing, resulting in a property-tax decrease for almost all 12th District property owners (see chart below or click here to open in a separate window). The Senate-passed budget also maintains an important focus on higher education. It adds 1,800 slots for resident-undergraduate students at the state’s four-year higher-education institutions and is focusing 70 percent of those slots on students seeking the STEM (science, technology, engineering or math) degrees that are in high demand in our state. Over the past four years, the Legislature took significant steps to help make college more affordable, first by freezing in-state tuition in 2013-15 and then by reducing it an average of 15% in 2015-17. Now it’s time to increase enrollment – good news for parents frustrated at seeing their children excel in high school only to see them turned down for admission in our state universities. Affordable and accessible higher education is important to me and to our state. Finally, by approving this budget with a month to go in the regular legislative session, the Senate is sending a strong and credible message about negotiating a final budget agreement on schedule. The US 2/West Cashmere Bridge that carries Goodwin Road across the Wenatchee River and the BNSF rail line is 85 years old and expected to fail structurally, possibly to the point of closure, within five years. Already the condition of the bridge is forcing heavy-truck traffic through downtown Cashmere, affecting emergency-response times and constraining local economic-development efforts. Replacing the bridge has been a high priority with local officials, yet the project was left out of the big package of transportation projects of 2015. 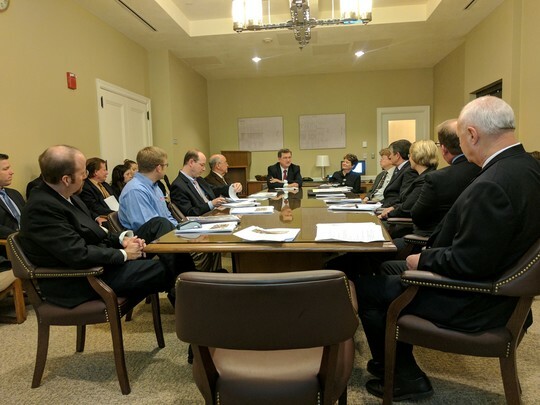 As a member of the Senate Transportation Committee, I arranged for local officials to meet recently with the two key legislators in the best position to help: the chairs of the Senate and House transportation committees. Also attending were key staff to both of the committees. The local leaders did a fantastic job of presenting a compelling case for funding. Representatives Steele and Condotta also attended in support of this project. We hope a funding solution is possible in the weeks ahead as the Legislature develops a final transportation budget. City and county leaders discuss the US 2/West Cashmere Bridge project with (at far end of table) Sen. Curtis King, R-Yakima and Senate Transportation Committee chair, and Rep. Judy Clibborn, D-Mercer Island and House Transportation Committee chair. The “ambassadors” for the US 2/West Cashmere Bridge project were: Keith Goehner, Chelan County commissioner; Eric Pierson, county engineer; Jeff Wilkens, Chelan-Douglas Transportation Council executive director,; Jeff Gomes, Cashmere mayor; Paul Nelson, Cashmere school board member (and Chelan County deputy sheriff); JC Baldwin, Port of Chelan County commissioner; Pat Jones, the port’s executive director; and Drew Dalgetty, general manager at Cashmere-based Crunch Pak. I could not be more impressed with the fabulous presentation they delivered. I think the committee chairs were appreciative of the effort and now clearly understand the need for this project and the priority it is for our area. 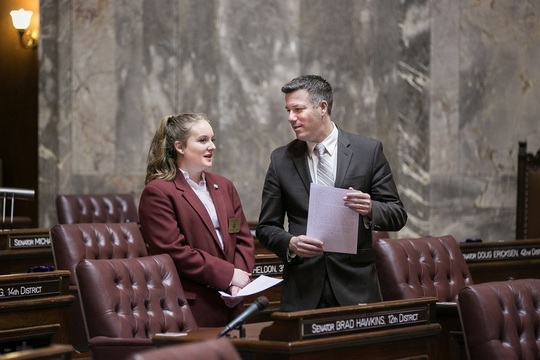 I was delighted to sponsor Courtney Ulrich, a 14-year-old 8th-grader at Pioneer Middle School in Wenatchee, as a Senate page this past week. Courtney’s week of service coincided with the visit from the Wenatchee Apple Blossom Festival’s Royal Court (she met Governor Inslee when the queen and princesses did). She also attended the press conference for the unveiling of the Senate’s new operating budget. These were unique experiences that I hope she enjoyed!